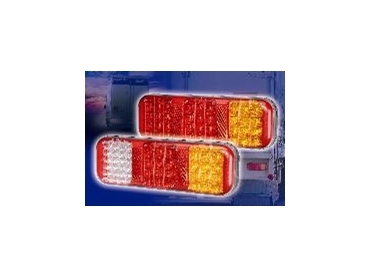 Advanced technology in high output LED’s has led to the development of what can be regarded as the ultimate rear combination lamp for light commercials, I tonners, camper vans, all trailer types and boat trailers in particular. Designed and manufactured by Brown & Watson on the footprint of Australasia’s popular rear combination lamp, Model 42 released from Narva offers a totally new approach to rear multi-voltage lighting. This innovative Australian design with universal applications is one of the first to incorporate an integrated LED reverse lamp. With the design registered in Europe, the lamp is fully E and ADR compliant and already orders are flowing from Europe and other parts of the world. Constructed of virtually unbreakable polycarbonate with inbuilt reflex reflectors, stainless steel fittings and sonically sealed with 0.5metres of hard-wired cable, the lamps will withstand the harsh commercial environment. The lamps are free from the problem of water and dust ingress. Competitively priced, utilising the new LED technology, Model 42 lamps are available in a rear combination of stop, tail and direction indicator with reflectors, or stop, tail, direction indicator and reverse lamp with reflex reflectors. With a depth of just 35mm, both versions of the low profile lamps are also multi-voltage 9-33 volts. Answering the prayers of every boat owner, a special kit is also available under a Narva Marine Part No. 94206TP. This includes two submersible Model 42 stop, tail, direction indicator lamps, hard-wired with 9 metres of cable coupled with an ADR compliant sealed licence plate lamp, also with 9 metres of hard wired cable. This combination allows additional electrical connections to be made at the towing vehicle, well beyond the trailer submersion level, virtually eliminating corrosion, electrical faults and early failure. The new Model 42 Narva lamps are available from automotive, transport, marine and 4WD outlets throughout Australasia.